This model is known to run in JSIM, COR and OpenCell to recreate the published results. The units have been checked and they are consistent. The CellML model was created by Alberto Corrias and taken from the NUS Computational Bioengineering Laboratory website. Abstract: Interstitial cells of Cajal (ICC) are responsible for the spontaneous and omnipresent electrical activity in the stomach. A quantitative description of the intracellular processes whose coordinated activity is believed to generate electrical slow waves has been developed and is presented here. 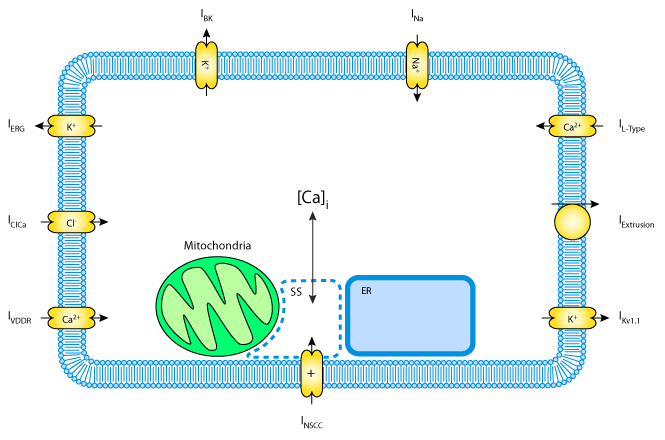 In line with recent experimental evidence, the model describes how the interplay between the mitochondria and the endoplasmic reticulum in cycling intracellular Ca2+ provides the primary regulatory signal for the initiation of the slow wave. The major ion channels that have been identified as influencing slow wave activity have been modeled according to data obtained from isolated ICC. The model has been validated by comparing the simulated profile of the slow waves with experimental recordings and shows good correspondence in terms of frequency, amplitude, and shape in both control and pharmacologically altered conditions. The documented original is available at the National University of Singapore's Computational Bioengineering Laboratory website. Schematic view of the model. The intracellular space is divided in four compartments: cytoplasm, mitochondria, endoplasmic reticulum (ER), and submembrane space (SS). All membrane ion channels and transport mechanisms included in the model are depicted. Derived from workspace Corrias, Buist, 2008 at changeset bcb099930f46.